The woodland at Coed y Cerrig comprises three quite distinctive habitats. On the plateau at the top of the steeply sloping reserve, where the ground is driest, there are mature Beech, Sessile Oak, and Ash trees; lower down, the more moist conditions support Birch, Hazel and Ash; and on the valley floor, where the ground is very wet for most of the year, the trees are mainly Willow and Alder. This makes the woodlands at Coed y Cerrig a very interesting place, rich in its diversity of wildflowers and lower plants that need these very different habitat types. The reserve is not just about plants, though, because the mosaic of different woodland types means that it is species rich in other respects and therefore an excellent site to visit if you are interested in birds and insects. In short, it is an ideal nature reserve for the all round general naturalist. Coed y Cerrig National Nature Reserve is managed by Natural Resources Wales (NRW). From Abergavenny take the A465 road northwards in the direction of Hereford. About 6km (4 miles) outside Abergavenny turn left into the village of Llanfihangel Crucorney. Some 500m later, while inside the village, turn left beside the Skirrid Mountain Inn onto a minor road signed towards Llanthony. After travelling for 2km along this road you will come to a fork in the road at the (unsigned) little hamlet of Stanton. Take the left fork towards Crickhowell. Coed y Cerrig NNR is situated a little more than 1.5km (one mile) along this minor road. There is an information board beside the road and alongside it sufficient parking space for about four cars on the side of the road, which runs on through the woodland itself. This reserve is open all year round. To the south of the road that runs through the reserve there is a boardwalk some 300 metres in length; it extends through the wet woodland section, making access possible for wheelchair users and for prams and pushchairs. At various points along the boardwalk are several carved information boards and there is a leaflet dispenser. From the north side of the road there is a short circular route consisting, in part, of rough stone steps. This route passes through the drier woodland habitats before dropping down again into the car park. In wet weather this path can be slippery, and so good footwear is essential. There are no facilities at this nature reserve other than information boards. There are, however, pubs, shops, cafés and public toilets in Abergavenny, Crickhowell and other nearby towns and villages. Below: Bright golden summer Chanterelles (Cantharellus cibarius) showing the typical gill-like wrinkles on the underside of the cap. Mature broadleaved trees produce dense canopies that can severely limit the amount of light penetrating through to the ground. As a result the woodland flora is often poorer than where the trees are small and the overhead cover sparse. There are, however, some plants that are specially adapted for living in such conditions and are not found anywhere else. The rare Bird's-nest Orchid (Neottia nidus-avis) is one of them. You have to look quite hard to find Bird's-nest Orchids, because they are so well adapted to the habitat of dense leaf litter and are almost the same colour as leaf litter: all parts of the plant are a brownish-yellow. This is a saprophytic plant which, being devoid of chlorophyll (which plants must have if they are to manufacture food for themselves), is incapable of photosynthesis. Once they become mature plants, Bird's-nest Ochids are thought to be entirely dependent upon nutrients in decaying matter beneath the thick layers of dead leaves that carpet the ground. Research shows that, like many orchids and other plants, germination of a Bird's-nest Orchid seed is possible only if it becomes 'infected' with particular kinds of fungi; however, the jury is still out as to whether or for how long the plant remains dependent on its relationship with fungi. A proven continued relationship would move its classification from the saprophytic to either a parasitic or a symbiotic method of obtaining nutrients. Given the presence of fungi-dependent plants, it should not be surprising to learn that Coed y Cerrig is also an excellent place to see macro fungi such as mushrooms and toadstools in the autumn. 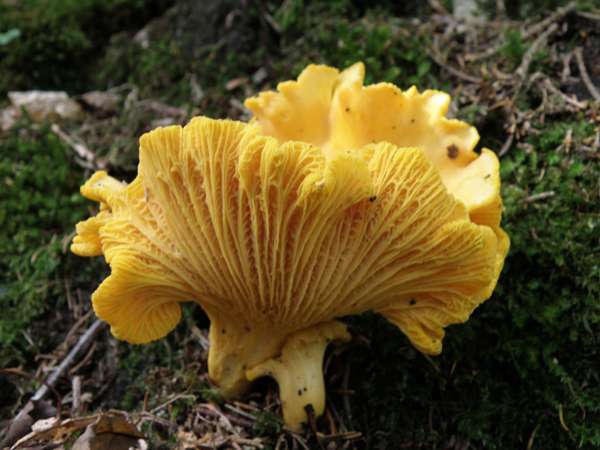 Summer Chanterelles (Cantharellus cibarius), which are among the most delicious of edible mushrooms found in the wild, appear in this woodland nature reserve, and their fruitbodies can occur in good numbers from July onwards. Chanterelles can be difficult to spot, especially in low rainfall years when, infuriatingly, yellow leaves fall early from the trees and create false alarms that compete for our attention. Lower down in the reserve another very interesting and unusual plant is lying in wait for the observant: Toothwort (Lathraea squamaria). Unlike the Bird's-nest Orchid, which is thought to feed (when fully grown, at least) on dead plant matter, Toothwort, which is also devoid of chlorophyll, is a parasite that steals nutrients from other living plants that share its space. This sepulchral wildflower is a member of the Broomrape family (Orobanchaceae), within which there are some species that do immense damage to crops in various parts of the world. Toothwort often grows on the woody roots of Hazel, which occurs on the lower slopes of Coed y Cerrig. 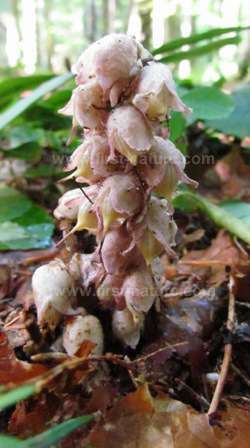 The pink-to-cream flower spikes of Toothwort appear in April and May, and they can grow up to 25cm in height. Although it could hardly be described as pretty or beautiful, this parasitic woodland wildflower definitely qualifies for the 'interesting' tag. Far more beautiful is Nettle-leaved Bellflower (Campanula trachelium). Now described as being only 'locally common' in Britain, we are lucky to be able to see this lovely wildflower in Wales. Its graceful flower spikes grow up to 75cm in height and they are at their best in July and August when many other wildflowers have already gone over. While lingering in this part of the woodland at Coed y Cerrig, look out for two other unusual species: Early Purple Orchid (Orchis mascula) in early springtime, and rather later Herb Paris (Paris quadrifolia), which is becoming rare. The latter is a strange plant and definitely a 'quality indicator' for woodland; its presence shows that the area has remained unchanged and unaffected by human activities for a very long time. The flowers of Herb Paris are curious; they have green, elongated petals topped with a purple ovary and yellow stamens. Herb Paris blooms in May and June, but this is another species that needs a careful search if you are to have any chance of finding it. The lowest part of the woodland runs along the valley floor. This is by far the wettest area and it is where the boardwalk runs. Built by CCW, this excellent facility enables us to enjoy the many plants, insects and animals that live in this watery zone of Coed y Cerrig. Be careful not to get too carried away, though, as only one step off the boardwalk could result in much worse than merely wet feet! From February onwards when Opposite-leaved Golden Saxifrage (Chrysosplenium oppositifolium) cascades down rocks that run with water, there is always something interesting to see here. 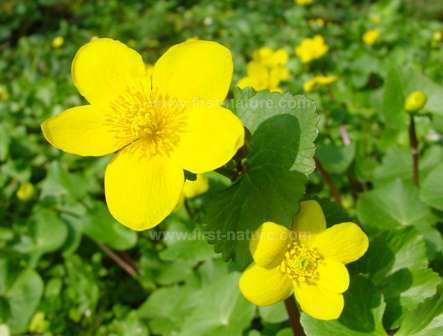 One of the earliest spring flowers of muddy and boggy places is Marsh Marigold (Caltha palustris). Also known as King Cups, this is a 'beacon' of a wildflower whose shiny bright-yellow cups light up marshy places from March onwards. Although a few other flowers such as Snowdrops and Lesser Celandines bloom before Marsh Marigolds, the first glimpse of this magnificent wildflower is always enough to convince me that I have survived another winter and that spring is well and truly on its way. Although we have plenty of Marsh Marigolds in Wales, their range is contracting as we drain more and more wet land. Complacency about this flower, and the habitats which it and many other species depend upon, is therefore not an option. The now nationally scarce Marsh Fern (Thelypteris palustris) also finds a home in the wet woodland of this nature reserve. Its population seems to be increasing in the wet woodland part of the reserve, which is shares with other typical wetland plants including Water Mint (Mentha aquatica), Hemlock Water Dropwort (Oenanthe crocata) and Yellow Pimpernel (Lysimachia nemorum). Wet habitats with plenty of wildflowers are always an indication that insect life will be good, and Coed y Cerrig is no exception. At least 13 butterfly species have been recorded in the reserve, including the Speckled Wood (Pararge aegeria) and the Silver-washed Fritillary (Argynnis paphia). In summer the air is alive with Damselflies and Dragonflies along with numerous other small insects that prefer the moist areas of the reserve. Abundant insect life always attracts birds, and nearly 30 species have been recorded at Coed y Cerrig, including good numbers of spring and summer migrants that move in to nest and raise their young, adding to the resident population of the woodland. Bird worth looking out for include the Great Spotted Woodpecker (Dendrocopos major), Redstart (Phoenicurus phoenicurus), Wood Warbler (Phylloscopus sibilatrix), Pied Flycatcher (Ficedula hypoleuca) and Blackcap (Sylvia atricapilla). Last but not least, one of our most endearing mammals makes it home in Coed y Cerrig: the Dormouse (Muscardinus avellanarius) feasts on the Hazel nuts found on the trees on the lower wooded slopes. Honeysuckle, the bark of which the Dormouse uses to build its nest, is also plentiful in the woodland.